We were talking on the forums at dragonsfoot.org sometime c. 2003ish about how it seemed like there was increasing interest in older approaches to D&D exemplified by stuff like Necromancer Games "3E rules, 1E feel" slogan and Hackmaster and the Dungeon Crawl Classics modules aping old TSR trade dress and Troll Lord Games' plans to create an OGL 1E-like system that Gary Gygax could use as the basis for his "Castle Zagyg" reskinning of the original Greyhawk Castle Dungeons, and so on, and someone said "it's almost like there's an Old-School Renaissance on the horizon" and the phrase struck a chord and we started using it after that, as a joke at first but a few years later people (mostly "come-lately" types like James Maliszewski) started using it more seriously. That D&D is better and more fun when you include the material Gary Gygax added to AD&D in the early 80s that was originally published in Dragon magazine and later collected in the Monster Manual II, Unearthed Arcana, and the World of Greyhawk boxed set, and when you continue to expand beyond it in the same aesthetic spirit. 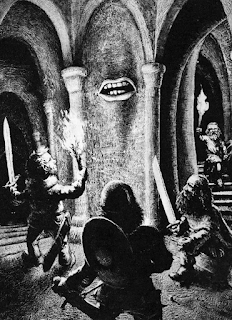 You can still have fun with D&D without needing to (a) remain permanently frozen in amber in 1979, (b) embrace all the lazy and tonally-dissonant garbage TSR and Wizards of the Coast churned out after 1985, or (c) reimagine D&D into something so "gonzo" that it's no longer recognizable to what we fell in love with as kids. Because, before the OSR, D&D (versions 3.5 & 4.0) had gotten to be almost totally about math and bean-counting and "character builds" and had lost sight of the freewheeling spirit of actual play, and the OSR reminded folks (including/especially younger folks who missed the "old-school" era the first time around) that it wasn't always and didn't need to be that way. i) Midkemia Press is selling (and in some cases even giving away) their old books in pdf format. Their book Cities is still one of the best, most useful rpg products ever published IMO. The rules don't matter. They never mattered. If you think they matter, you've missed the point. I glossed over that first one! Hopefully I can get PART 2 of that swinging. The map is done but text needs to be ironed out. I'm stuck on the first part of the planar. I was finalizing the art a certain way and it was a forced march that wasn't working so this will be the first set with B&W sketches and a color diagram. I was originally setting them in a for instance of how these monsters work. I popped it open the next day and thought someone is going to make this permanent in their mind then its going to stick forever like how kobolds are now dragons so I needed to back up.